Of course, one of the attractions of such “green” cars is that they use much less gasoline than standard internal-combustion autos, a feature that definitely appeals to consumers concerned about unpredictable fuel prices. But there are other appealing features as well: moving to electric-powered vehicles will reduce the country’s dependence on oil for transportation. Electricity is produced domestically—as opposed to gasoline produced from fossil fuels imported by tanker or pipeline—a power source less affected by the volatile world oil market. And electric-powered cars run “clean;” they produce very low amounts of air-polluting emissions—or, in the case of all-electric vehicles, no emissions at all. This is beginning to sound like a win-win scenario: cars that are both financially and environmentally sound. Of course, no new technological development is ever that simple or easy. These new types of vehicles require batteries in addition to, or in place of, a gas tank. It should be kept in mind that the process of manufacturing the batteries themselves contributes to energy consumption and pollution. Nor is electricity itself a pollution-free source of power. It must be produced at power plants, which mostly utilize coal, petroleum, or natural gas as fuels; half of the electricity in the United States is produced by coal. (Electrical generation from “green” sources such as solar or wind power are not currently a major factor, though they could well be in the future.) Power plants emit carbon dioxide and other pollutants, such as sulfur, mercury and nitrogen, into the atmosphere. And there are transmission losses in getting the power to the consumer, and further losses when charging batteries (about 50%). Walking is probably the most pollution-free and energy-conserving form of transportation (“energy-conserving” in terms of industrial manufacturing, not for the person walking!). But until cities become more pedestrian-friendly, cars are going to continue to have a major role in personal transportation. Clearly, automobile manufacturers see “greener” cars such as the Toyota Prius, Chevy Volt, or Nissan Leaf, as a growing part of the automotive market, and the batteries to power those cars are the subject of intense interest and research. This fact sheet will discuss car batteries, both current and future, and the automobiles they power. We’ll start with a basic refresher course in how batteries work. As a result of chemical reactions within the battery, there is a build-up of electrons at the negative electrode, leading to a potential difference between the negative and positive electrodes. When the circuit is closed—i.e., a connection is made between the negative and positive electrodes—electric current flows. The composition of the electrodes and electrolytes varies, depending on the type of battery. Electrolytes can be in the form of a liquid (a wet cell or flooded cell battery) or a paste, containing only enough liquid to allow current to flow (a dry cell battery). Historically, wet cell batteries were the first to be developed, but have mostly been replaced in everyday use by dry cell batteries, which can be operated in any position without the worry of spilling or leaks. Wet cell batteries are, however, commonly used in motorcycles, boats and cars. You probably are aware that batteries come in two basic forms: single-use or primary batteries, which are discarded once they run down, and rechargeable or secondary batteries, which can be reused many times. Secondary batteries can be reused because the chemical reactions that take place inside them can be reversed by applying electric current. This reversibility isn’t infinite, though; gradually the battery loses its ability to be recharged as the active components dissipate and corrosion builds up inside. All car batteries, regardless of their internal chemistry, are rechargeable; however, the frequency of replacement depends on the battery’s chemical make-up. Runtime: the length of time a battery can power a device. Energy density: the amount of available energy per unit volume. In a battery, the higher the energy density, the longer the runtime. Electric vehicles are powered by batteries with high energy densities. Power density: the amount of energy a battery can deliver on demand. A starter motor requires a battery with a high power density. Cycle life: the number of times a battery can be charged and discharged before failing. Today’s typical car is powered by a gasoline-fueled internal combustion (or IC) engine. And that IC engine is initially “fired up” by a starter motor, powered by a lead-acid battery. Lead-acid batteries have been used in cars for many decades—in fact, the lead-acid battery is the oldest rechargeable battery known—and the technology is “mature,” meaning it’s well understood. Not surprisingly, lead-acid batteries are both bulky and heavy, and have a low energy-to-volume ratio and energy-to-weight ratio. But they have high power density—meaning they can supply the powerful surges of current needed by a starter motor—and are inexpensive to manufacture. An automotive battery is basically a plastic box containing lead alloy plates, which are sitting in a bath of water and sulfuric acid; the plates are the electrodes, and the acid solution is the electrolyte. The container for a 12-volt lead-acid battery is divided into six cells. Each cell contains both positively- and negatively-charged plates; positive plates are made of lead oxide, while negative plates are made of lead metal. (The “plates” are actually grids, a configuration used to increase the surface area available for the reactions that produce the electrical current.) A chemical paste is applied to retard corrosion and improve battery life. To prevent a short circuit, the plates are kept from touching each other by means of separators. During discharge, the electrodes are transformed into lead sulfate; the sulfur is supplied by the sulfuric acid in the electrolyte, which becomes increasingly dilute. During charging, the sulfate is transformed back into acid and water, by releasing hydrogen and oxygen gases, which escape through vents in the casing. Because of this loss, lead-acid batteries require occasional additions of water to maintain the acid-water solution at the correct concentration. The VRLA battery most commonly seen in the automotive marketplace is the absorbed glass mat (AGM) battery. The battery’s separators are made of fine glass fibers woven into mats, which greatly increase their surface area. The glass fibers are not affected by battery acid and do not absorb it, but rather hold it in place via capillary action. An advantage of this form of construction is that the battery is unspillable, with no chance of leakage; it is also maintenance free. Research is ongoing to develop advanced lighter-weight high-power lead-acid batteries, but they are unlikely to be part of the consumer electric vehicle picture any time soon. The nickel-metal hydride battery first appeared on the market in the 1990s. A variant of the nickel-cadmium battery, its positive electrode is made of nickel-oxide-hydroxide (also referred to as nickel oxyhydroxide); the negative electrode is made of a hydrogen-absorbing compound, the exact composition depending on the manufacturer. Unlike the lead-acid battery, the electrolyte is an alkali, usually potassium hydroxide. When discharging, the electrodes combine with hydroxide ions from the electrolyte, forming metal-hydroxide compounds and water, releasing energy in the process. When recharging, these compounds re-combine with water, releasing hydroxide ions. NiMH batteries are sealed and maintenance-free. NiMH batteries have good energy densities and don’t suffer from “memory effect,” a problem with the earlier nickel-cadmium battery. (If not fully discharged before recharging, a battery with memory effect can lose capacity.) They do “self-discharge” (meaning the power slowly drains from the batteries whether they are in use or not), the rates of which depend on air temperature; but because battery-powered cars are recharged on a daily basis, this is not a major issue. Lithium-ion batteries were first developed in the 1970s, using lithium metal as one of the electrodes. But because of safety issues surrounding the use of metallic lithium, researchers developed electrodes made of compounds containing lithium ions, rather than pure lithium. A typical example consists of an anode made of graphite and a cathode of a metallic oxide such as lithium iron phosphate, lithium cobalt oxide, or lithium manganese oxide. The electrolyte is non-aqueous—because lithium reacts very vigorously with water—and consists of an organic solvent containing a lithium salt; the battery case is sealed to keep water out. During discharge, lithium ions move from the anode to the cathode, producing electric current; when recharging, the process is reversed. These batteries have a complex composition, and battery characteristics can vary depending on the choices the manufacturer makes for electrodes and electrolyte. We tend to use the term “battery” as if it was a single, discrete object, but in fact, a battery is a collection—think of a battery of guns, for example. Electrical cells can be grouped together and connected to provide either more current (if connected in parallel) or more voltage (if connected in series). The common 9-volt battery that supplies power to your smoke detector really is a battery: it’s a casing holding six small 1.5 volt cells connected in series. Cars need a lot of power, and so car batteries are made of a lot of cells packed together. And those battery “packs” take up space and add weight. Auto designers have to take this into account in the planning stage, and make allowances in the architecture of the car; one way they do so is by using light-weight materials such as carbon fiber or magnesium to build the car. Batteries can be classified in several ways: by their chemistry (lead-acid, lithium-ion, nickel-metal hydride; all discussed earlier in this fact sheet), or their structure (flooded cell, VRLA; also discussed earlier)—or their function. We usually think of automobile batteries in terms of starting the car, and indeed, they’re sometimes referred to as starting, lighting and ignition (SLI) batteries: that is, the battery powers the starter motor, lights, and the ignition system of the engine. SLI batteries deliver a surge of energy for a short period of time in order to start the engine—they have high power density. But batteries can also be propulsion (also referred to as motive or traction) batteries: they supply the power to move a car. This is a different function, and calls for batteries with different characteristics: to be able to deliver a steady supply of power for a sustained length of time, a characteristic known as energy density. Energy density can be thought of as the amount of energy the battery can hold (and power density as how fast you can get it out). One of the big issues for companies developing electrically-powered cars is the problem of range: how many miles will the car travel before the battery has to be recharged? Car manufacturers claim the batteries powering their hybrid vehicles deliver anywhere from 15 to 60 miles on a single charge. While those ranges may not sound like much—after all, you can drive up to 300 miles on a single tank of gas—research has shown that most Americans commute 30 miles per day or less. Another issue for developers (and for potential customers): how many times can a battery be recharged? How long will it take to recharge? And where do you recharge? Recharge times for plug-in hybrids and all-electric vehicles vary greatly, and it all depends on how you recharge: by using a regular 110/120 volt household outlet—sometimes called trickle charging—or alternately, by utilizing a specially-installed dedicated charging station. The former is slower, taking anywhere from 8 to 20 hours for a complete charge. Recharging time also depends on the size of the battery in your car; hybrids generally have smaller batteries than all-electric vehicles, and thus recharge more quickly. If you follow manufacturer’s recommendations and install a dedicated charging station with a 220/240 V outlet in your garage or beside your driveway, charging time is cut by more than half. These stations are more than just a higher voltage plug; they include “smart charging,” so that you can program them to charge at night, when electric grid demand is lower (and when power prices may be cheaper). Many dealers have a partnership with a charging-station manufacturer, and offer special prices to electric vehicle buyers. Prices range from $500 to $900, depending on the electrical configuration of your garage, but are dropping fast. Public recharging stations are spreading quickly, though they aren’t nearly as ubiquitous as gas stations—yet. The whole question of supportive infrastructure for public and private charging stations is now being studied, tested, and implemented by industry, city planners, and institutions; see the “Charging Up for Recharging” section later in this fact sheet. The cost of charging your car at a public station will vary, depending on the price of electricity where you live and the size of the battery pack. Consumer Reports says “Overall, you can expect an electric car to cost about 4 cents a mile to charge at national average electric rates. A conventional car that gets 30 mpg would cost about 9 cents a mile to fuel.” (Prices are as of April 2014.) Note that this isn’t the entire story. Some charging station operators offer membership cards or subscriptions with reduced prices; or charging may be included in the parking fee. Retailers or malls may offer free recharging stations to encourage plug-in car owners to shop at that location. And some workplaces have charging stations as an employee perk; recharging may be free of charge or subsidized by the company. Finally, safety is a concern (as it is for any car—it’s worth keeping in mind that the traditional gas-powered car carries 15 or more gallons of toxic, extremely flammable fuel). Although there have been several highly-publicized incidents of battery-caused fires, compared to the number of vehicles on the road the actual occurrence is rare. David Friedman, deputy administrator of the National Highway Traffic Safety Administration (NHTSA), said in an interview at the 2014 North American International Auto Show, “We believe they don’t pose any greater risks that gasoline-fueled vehicles.” Lithium-ion batteries, the culprit in the incidents, don’t explode spontaneously, and they have improved protection circuits and venting to increase their safety. Some manufacturers have added a heating/cooling system to keep battery packs at the optimum temperature, or extra shielding to protect the battery from punctures. The first hybrid car sold in the U.S. was the Honda Insight, in 1999. Now most manufacturers are offering—or planning to offer within the next year or two—hybrid or all-electric models in a range of vehicles to choose from, from compacts and sedans to SUVs and trucks. At the present, there are three types of electric vehicles available. Two of them are hybrid vehicles, meaning they get their power from both a gasoline engine and an electric motor; the third is powered solely by electricity. Figure 1 is a representative comparison of engine and battery capacity in the 3 types of electric vehicles. The hybrid electric vehicle (Figure 1-A), as mentioned above, has both a gasoline-powered internal combustion engine and a battery-powered electric motor. The battery can be either nickel-metal hydride or lithium-ion, though the industry is moving fast towards the latter as the standard, because of its lighter weight and greater energy density. Figure 1. A comparison of engine and battery capacity in electric vehicles. [Click image for full size version.] Image: PREC. The gasoline engine is the main source of power, assisted by the electric motor. Because of this augmentation, the engine can be smaller and more efficient, sized for average power needs rather than rarely-used peak power needs. If the engine doesn’t have enough power—to climb a hill, for example—the motor is there to provide the extra “oomph” needed to make it to the top.An onboard computer handles the switching to ensure optimal efficiency. When less power is needed—when traveling at low speeds or idling at a stoplight—it will shut off the engine and rely on the electric motor alone.The battery is charged by using power from the engine and by regenerative braking, which “recaptures” some of the energy usually lost in braking. The electric motor acts as a generator while slowing the car, charging the battery.Other design features that improve the hybrid’s mileage include aerodynamic design and low rolling resistance tires to reduce drag, and lightweight materials, such as carbon fiber or magnesium, to reduce vehicle weight. As a result of these innovations, a hybrid has about twice the fuel economy as a gasoline-only car of similar size. The plug-in hybrid electric vehicle (Figure 1-B) can be thought of as the inverse of the standard hybrid: instead of the gasoline engine being the main power source and the electric motor acting to back up the engine as needed, the motor is the main source of power, with a smaller engine assisting. It’s designed to travel extended distances on electricity alone; the engine provides additional power for recharging the battery and giving an extra surge when needed for acceleration. The battery can be recharged through regenerative braking, by using power from the engine, or by plugging into a standard household outlet; recharging takes three to twelve hours, depending upon the make and model of car. The owner can also install a dedicated recharging 220/240V outlet, which cuts recharge time by half or more. A plug-in hybrid gets about twice the fuel economy of a standard hybrid. The electric vehicle (sometimes called the battery electric vehicle) (Figure 1-C) gets all its power to run an electric motor from its battery pack; it has no engine and thus uses no gasoline at all. As with the plug-in hybrid, the battery is recharged by regenerative braking and by plugging into a household outlet or charging station. Because an electric car has no engine it doesn’t require oil changes, and due to regenerative braking, there is significantly less wear on the brakes. In general, it has fewer moving parts than either a gasoline-powered or a hybrid vehicle. As a result, it requires only minimal maintenace. An all-electric car can be up to three times as efficient as a gasoline-powered car. It can be pretty confusing trying to figure out fuel economy when you’re comparing gasoline-only cars with hybrid-electrics, plug-in hybrids, and all-electric cars. 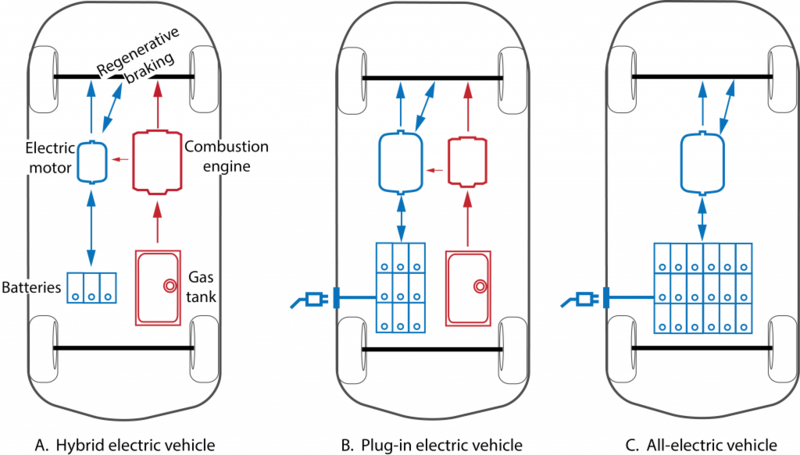 How do you make a comparison between two plug-in hybrid vehicles? How far each travels on a tank of gas, or how far each goes before needing to recharge? Add an all-electric model to the mix and it can get even more confusing. “Miles per gallon” is meaningless when you’re trying to determine the fuel economy of a car that doesn’t even have a tailpipe, let alone a gas tank. Aware of this problem, the U.S. Environmental Protection Agency (EPA) and the National Highway Traffic Safety Administration (NHTSA) released new window stickers in 2011, which are displayed on all new cars. 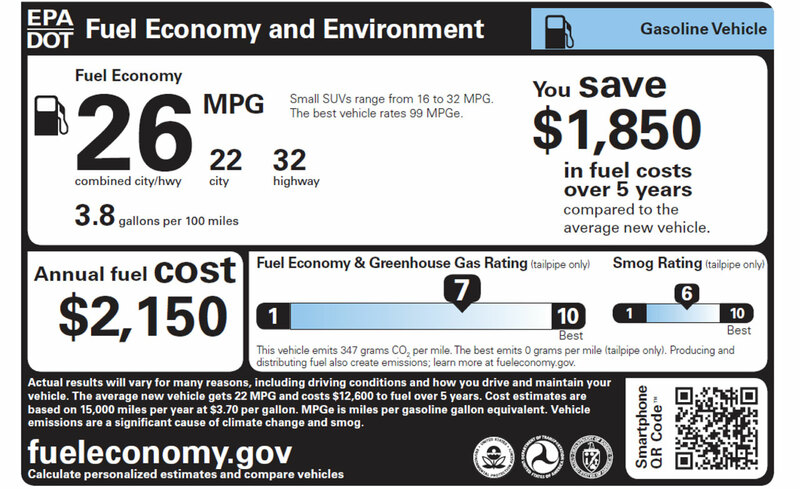 These Fuel Economy and Environment Labels are available for a wide range of vehicles and powertrains: gasoline-powered, hybrid, plug-in hybrid, and all-electric, including currently exotic variants (for the U.S.) such as dual-fuel cars and those powered by hydrogen fuel cells or natural gas. 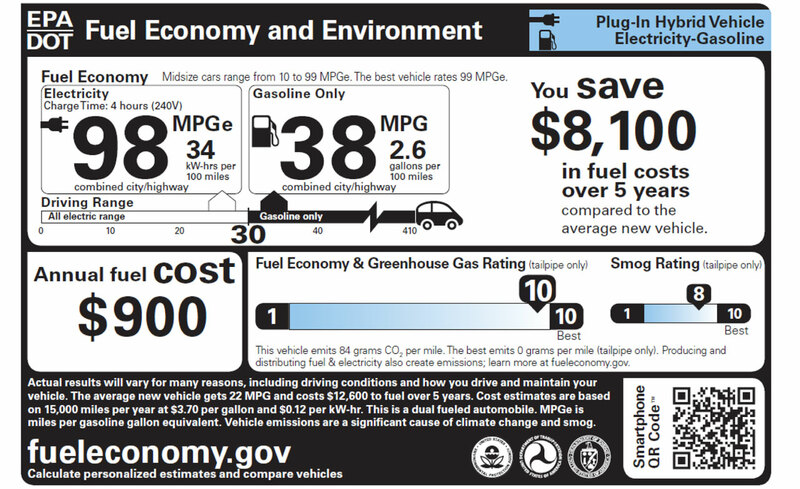 The new labels—examples for a gasoline-powered vehicle (Figure 2) and a plug-in hybrid (Figure 3) are shown below—make it easier for consumers to compare mileage and environmental impact for different car models and powertrains. They also include a QR Code® which can be scanned by any smartphone with a scanner app, which will link to additional information about that particular vehicle. Figure 2. Window sticker for a gasoline-powered automobile. [Click image for full size version.]. Figure 3. Window sticker for a plug-in hybrid vehicle. [Click image for full size version.]. Image: www.fueleconomy.gov. For a full explanation about the information shown on the labels, check the page Learn About the New Label on the www.fueleconomy.gov website. If you’ve bought a new car battery, then you know already that lead-acid batteries are recycled; in fact, you may have been charged a fee if you didn’t bring in your old battery when getting the new one. Recycling of lead-acid batteries is one of the most successful programs in the United States: more than 96% of car batteries are recycled. What happens to an old car battery? It’s broken into pieces in a hammer mill, and the pieces go into a vat. The plastic casing pieces float to the top and are separated away, to be processed into new cases. The metallic lead grids and lead oxide are re-smelted to produce new lead battery components. The sulfuric acid is treated in one of two ways: it can be neutralized, which transforms it into water; after testing, the water is released into the sewer system. Or it can be processed into sodium sulfate, an industrial chemical which is used in detergents, glass, and textile manufacturing. While lithium-ion batteries may be recycled for their metal and chemical content, they can also follow a completely different path. This is because a “dead” Li-ion automotive battery isn’t really dead—it still contains energy (up to 70% of original levels), but doesn’t meet the performance criteria required for powering a car. However, it has plenty of energy for less demanding, lower-power situations. And since the number of used batteries is only going to be increasing as electric vehicles grow in popularity, it makes sense to explore the possibilities of these “second life” uses. Stationary storage offers many opportunities. For example, they can be used as storage batteries for such renewable but intermittent power generation systems such as solar and wind; releasing it to the grid when demand calls for it. This load balancing is highly desirable, as it helps reduce the need for utilities to develop new power projects. Community energy storage is another possibility—repackaging of several batteries into a modular unit for one or more homes, both for everyday demands and for emergency power in situations such as hurricanes or other disasters. Second life batteries can be more cost-effective compared to all-new storage batteries, making their use economically appealing; they’re also more environmentally appealing when compared to, say, back-up generators. Several car makers have formed partnerships with their original equipment manufacturers to develop applications. In coming years, secondary markets for used batteries will help conserve expensive raw materials such as lithium without having to go through intensive recycling processes. And the resale value of used car batteries may reduce ownership costs for auto buyers, making so-called “zombie” batteries an attractive prospect for all concerned. Naturally there is much research into improving the batteries used in automobiles: to make them more compact, lighter in weight, more powerful, and more durable. Besides the obvious—car makers—there are other groups hard at work: university research groups, entrepreneurial start-up companies, and established manufacturers. The federal government’s National Renewable Energy Laboratory (NREL) has an entire website devoted to all aspects of transportation research; it collaborates with industry, government, and research partners to create better electric, hybrid, fuel cell, and conventional vehicle technologies; and charging and fueling infrastructure. In 2012, the Department of Energy (DOE) initiated the EV Everywhere Grand Challenge. It focuses on making the U.S. the first country in the world to produce electric vehicles by 2022 that are as affordable for the average American family as a 2012 gas-powered car. And as one of the most expensive components of an electric-powered car, the battery is one of the main focus areas of the challenge. Goals include: increasing the driving range to 250-300 miles per charge; reducing battery costs from the current $350-550 per kilowatt-hour (kWh) to $125 per kWh, and increasing battery lifespan from the current 8-10 years to 15 years. These are ambitious performance and cost targets, but ones the government feels must be met for electric cars to gain serious market share. You can get an idea of the difficulties in producing the ideal Li-ion battery for cars from Venkat Srinivasan, a staff scientist in Lawrence Berkeley National Laboratory’s Environmental Energy Technologies Division, who said in back in 2007, “Even after a decade of research, no magic combination of material has been found that has all the good attributes. So, research continues on three classes of cathode materials, four classes of anodes, and three classes of electrolytes, all in the hope of finding the right combination that will allow for commercialization”. As mentioned earlier, the infrastructure needed to support plug-in vehicles is developing quickly, thanks to a variety of initiatives and partnerships. The DOE has provided grants and incentives to electric vehicle equipment manufacturers, local governments, employers and retail businesses to install public charging stations. NREL, focusing on the big picture, has a subsection of its Transportation Research website devoted to integration of electric cars with the grid. It collaborates with automakers, charging station manufacturers, utilities, fleet operators, and other national laboratories on a variety of projects. These include (among others) battery life; integrating renewable resources—solar and wind—with vehicle charging; enabling plug-in vehicle communication with the smart grid (see the fact sheet The Smart Grid); and creating opportunities for vehicles to play an active role in grid management. The EV Project was a major DOE-sponsored initiative to deploy chargers in metropolitan areas of major cities across the country; car owners who participated received a residential charger at no cost, and part of the installation cost was paid for by the EV Project. Although that portion of the project is now over, the project continues to collect and analyze data on vehicle use under a variety of weather and topographic conditions, evaluates the effectiveness of charge infrastructure, and conducts trials of various revenue systems for commercial and public charge infrastructures. Project Get Ready, a non-profit initiative led by the Rocky Mountain Institute, in cooperation with a wide array of partners and technical advisors, is helping cities develop the infrastructure for plug-in vehicles. Their website includes a map of cities involved, with links to each city, charging station locations and information about federal and state tax credits, rebates, and local incentives to encourage electric vehicle purchase. A future where most motorists are driving clean, quiet-running automobiles may be here sooner than we think! New types of energy storage devices are constantly being developed. One project that is aimed at the transportation market is a FESC project between Planar Energy in Orlando and the researchers at the University of Florida. This project involves developing a non-vacuum based (think inexpensive) SPEED deposition process for producing a solid state Li-ion battery. The advantages of the solid state battery is that it has a higher energy density because more of the material is active rather than inert support material, and it is inherently safer since it cannot explode. Also, this opens the door to higher voltages and higher capacity electrodes (think more miles between charging) because you no longer have a liquid electrolyte. The goal of these projects is to produce a car battery with a significantly greater range and lifetime, and that is safer and cheaper. There are additional projects that may not find their way into cars to propel them, but can be utilized nevertheless for home electricity production, that is, to charge the batteries of the above-mentioned cars. Among these new developments is a high-temperature battery, based on sodium, such as the sodium-nickel chloride (Na-NiCl2) cell and the sodium-sulfur (Na-S) cell, in which liquid sodium is separated by solid electrolytes made from ceramic materials (sodium-β-alumina) that have an exceptionally high ionic conductivity. Another type of “rechargeable” storage cell, called the redox flow battery, has been developed, in which the electrolyte is pumped from an external tank through the device, converting chemical energy directly to electricity. The process is reversible, and thus can be utilized to store wind, solar and cheap night-time electricity. The flow battery functions on the fuel-cell principle: a fuel (e.g. hydrogen or methanol) and an oxidant (e.g. oxygen or air) undergo electron transfer reactions at the anode and cathode respectively. The anode and cathode are separated by an ion exchange membrane. Among the various types of flow batteries is the redox (reduction-oxidation) device in which the electroactive components are dissolved in an electrolyte. Examples are the polysulfide bromide battery and the vanadium redox flow battery. In hybrid flow batteries, the electroactive components are deposited as a solid layer. Examples are the zinc-bromide, cerium-zinc, and the all-lead flow batteries. These and other new developments should be followed with a great deal of anticipation. Battery Council International. (n.d.). Lead acid batteries. Retrieved May 27, 2015. Battery Solutions. (2012). End sites recycling process. Retrieved May 27, 2015. Battery University. A website that provides practical battery knowledge for engineers, educators, students and battery users. Retrieved May 27, 2015. Burke, A. (2009). Performance, charging, and second-use considerations for lithium batteries for plug-in electric vehicles. University of California-Davis, Institute of Transportation Studies. Retrieved May 27, 2015. Hummel, R. E. (2011). Electronic Properties of Material (4th ed. ), Section 7.8. New York: Springer Verlag. NREL: Transportation Research Home Page. (n.d.). Retrieved June 27, 2015. Nice, K. & Layton, J. (n.d.). How hybrid cars work. Retrieved June 27, 2015. U.S. Department of Energy. (2010a). The Recovery Act: Transforming America’s transportation section – batteries and electric vehicles. Retrieved June 27, 2015. U.S. Department of Energy. (n.d.). Vehicle Technologies Office. Retrieved June 27, 2015. U.S. Environmental Protection Agency. (n.d.). Fuel Economy. Retrieved June 27, 2015. First published May 2011. Updated May 2015. Voelcker, J. (2015, February 3). FINAL UPDATE: Plug-In Electric Car Sales Continue Rise In 2014, To 118,500. Green Car Reports. Retrieved May 29, 2015. Monthly Plug-In Sales Scorecard. (n.d.). Retrieved May 29, 2015. Evarts, E. (2015, January 16). Plug-in Hybrids Stake Their Claim in 2015. Consumer Reports, (Jan 2015). Retrieved May 27, 2015. Consumers still favor gasoline-fueled cars, but most are open to options. (2012, May 23). Consumer Reports. Retrieved May 27, 2015. Oak Ridge National Laboratory. (2014). Chapter 8 Household Vehicles and Characteristics, Figure 8-5, “Average Daily Miles Driven (per Driver), 2009 NHTS.” In Transportation Energy Data Book (33rd ed., p. 8-17). U.S. Department of Energy, Office of Energy Efficiency and Renewable Energy. Retrieved May 22, 2015. Top Hybrid/EV Ratings | Hybrid/EV Buying Guide .Consumer Reports. (2015, February). Retrieved May 27, 2015. Electric Car FAQs. Consumer Reports. (April 2014). Retrieved May 27, 2015. Public/ Commercial Charging | Go Electric Drive. Retrieved May 20, 2015. Best Practices for Workplace Charging. (2013, September). CALSTART. Retrieved May 27, 2015. Keane, A. G., & Kohn, B. (2014, January 14). Electric cars pose different risks, not more, U.S. regulator says. Automotive News. Retrieved May 30, 2015. NHTSA Hosts Electric Vehicle Safety Symposium.(05/2012). Retrieved May 20, 2015. National Highway Traffic Safety Administration (NHTSA). (2014, March). Interim Guidance for Electric and Hybrid-Electric Vehicles Equipped with High-Voltage Batteries (Law Enforcement/Emergency Medical Services/Fire Department). U.S. Department of Transportation. Retrieved May 30, 2015. U.S. Environmental Protection Agency, Office of Resource Conservation and Recovery. (2014). Municipal Solid Waste Generation, Recycling, and Disposal in the United States: Tables and Figures for 2012. Retrieved May 26, 2015. Evarts, E. (2013, October 4). What happens to electric car batteries when the car is retired? Consumer Reports. Retrieved May 29, 2015. NREL: Transportation Research – Energy Storage. (2015, January). Retrieved May 28, 2015. Chen, A. (2007, February). Batteries of the Future I: Modeling Lithium-ion Battery Behavior. Retrieved May 27, 2015.